We have created a 3 tier award system to recognize our members for their service to our society. The first one is also the highest award that we will have to offer. This award is for members only. The Clan Claus Society is proud of having almost 550 members in 13 countries. We want to recognize some individuals for their hard work and devotion to our efforts of creating our Christmas family. We could not have reached this milestone without the hard work and dedication of our members. 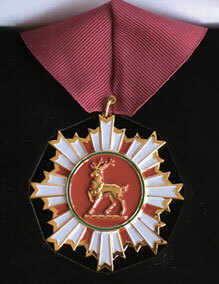 This award, The Order of the Benevolent Reindeer, is the highest award the society has to offer its membership. It was created to honor members of the society that have distinguished themselves by their contributions, words, and deeds to support the mission and purpose of the society. The purpose of the award is to honor merit, not mere popularity. To maintain the honor, integrity, and value of this award the following set of simple guidelines and standards have been established. The individual has been a member in good standing for at least 5 years. 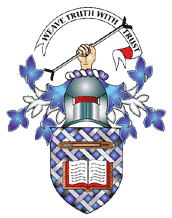 The individual is of high moral character and embodies the family values and standards which have been the integral cornerstone of The Clan Claus Society. The individual has rendered exceptional service in multiple ways, giving of their time and talents for the betterment of The Clan Claus Society. The Order of the Benevolent Reindeer Award will be attached to a maroon neck ribbon. 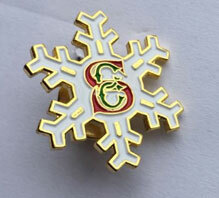 The medallion was designed to bear the resemblance to a snowflake. It has all of our colors that are represented in our tartan: Red, Green, Yellow, and White. Should you know of any individual(s) that you feel should be recommended for the award please send their information to me along with a brief outline detailing their service. The Heart of Charity medal is in the shape of a heart with three intersecting rings. The rings are a representation of the three bags of gold that St. Nicholas gave to the merchant. 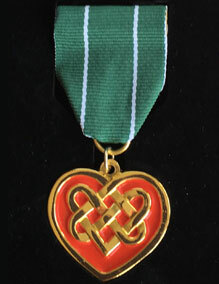 The Medal is attached with a green ribbon drape with two white stripes. The medal also uses all of our colors in our tartan Red, Green, Yellow, and White and was designed to bear the resemblance of Santa's big heart. This award can be presented to members and nonmembers that have performed great service to our society. Again these are just guidelines. An individual does not have to complete everything on this list. Be an active member in good standing for a minimum of 3 Years consecutively. Must have already received the Chairman's Service Award. Convene a tent for at least 3 years. Help the tent conveners with setting up and or breaking down the tent, manning the information tables or helping with the refreshments. Submit a story to the newsletter or write a column for the Newsletter. Serve on a committee for 3 years. Attend 2 games per year. Devise and fulfill a special project on behalf of the Society. Start a Clan Claus Society tent at a game where we have not had a tent before. Bring honor to the Society by completing another activity, not listed here, but deemed worthy by the Board. This award can be presented to members and nonmembers that have performed great service to our society. The individuals who are awarded The Chairman's Service Award represent the foundation of our Society. They are the rock of our Society! Again these are just guidelines. An individual does not have to complete everything on this list. Be an active member in good standing for a minimum of 2 years consecutively. Convene a tent for at least 2 years. Start a society tent at a game where we have not had a tent before. Complete another activity, not listed here, but deemed worthy by the Board of Governors. If you know individuals who may qualify for this award please contact Chairman. All of the awards Criteria and Standards are not set in stone and may be changed or amended without notice.